Future developments in tobacco control are likely to involve personalisation of treatment to improve efficiency. 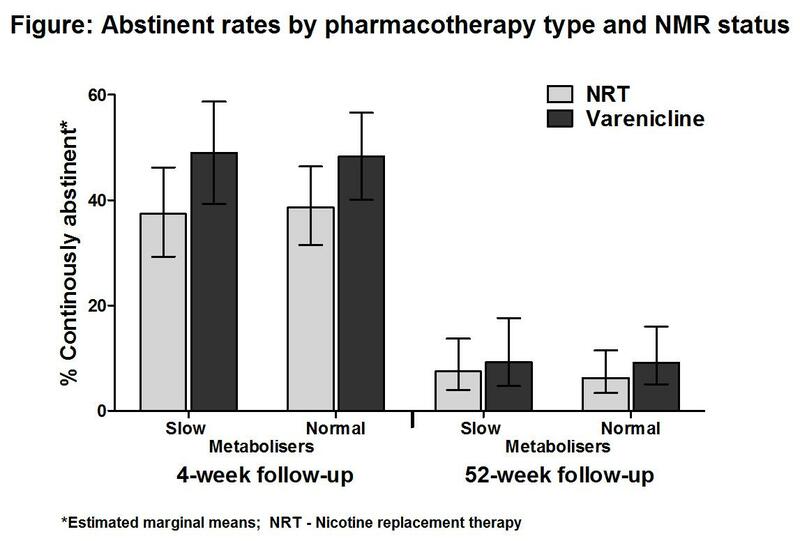 Pharmacotherapy provision based on Nicotine Metabolite Ratio (NMR) status has been shown to improve outcomes in clinical trials: normal relative to slow metabolisers benefit more from varenicline than nicotine replacement therapy (NRT) treatment. However, it is unknown whether this effect translates to other settings. Data come from 1,563 participants attending English Stop Smoking Services in 2012/13. Sociodemographic, mental/physical health, smoking (dependence, determination to quit) and treatment characteristics (varenicline vs. NRT; group vs. one-to-one behavioural support) were assessed at baseline. Baseline salivary nicotine metabolites were measured and NMR (3-hydroxycotinine/cotinine) status computed, characterising smokers as slow (NMR< 0.31, N=454) or normal (NMR≥0.31, N=1,109) metabolisers. Carbon-monoxide verified 2-week and 50-week continuous abstinence was assessed at 4-week and 52-week follow-up post-quit, respectively. The association between abstinence rates and predictor variables was determined using log-binomial generalised linear models that included a pharmacotherapy by NMR status interaction term and controlled for all covariates. All analyses were intention-to-treat. Of participants, 44.2% (95% confidence interval (CI) 41.8-46.7%) and 8.0% (95%CI 6.8-9.5%) were continuously abstinent at 4-week and 52-week follow-up, respectively. There was no evidence of a pharmacotherapy by NMR status interaction on either outcome in adjusted analysis (see Figure). Higher abstinence rates were independently associated with higher socio-economic group, treatment with varenicline, lower dependence and greater age at both follow-ups and with greater determination to quit and group support at 4-week follow-up, only. Our study did not replicate clinical trial data, indicating that NMR status does not substantially contribute to differential pharmacotherapy effectiveness in Stop Smoking Services. As this was an observational study, self-selection or unmeasured confounders may have influenced results. However, this suggests the effect of NMR in real-world settings is likely to be small, context-dependent and therefore may not translate globally.